Museum of Modern Art from New York hired Dan Perjovschi to create a page promoting the museum for the daily paper The New York Times, the subsidiary of the Romanian Cultural Institute from the American metropolis informs. 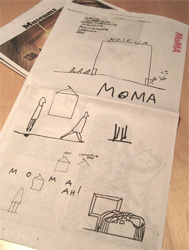 The March 12, 2008 edition of the American daily paper includes in the special “Museums” section a page of drawings by Dan Perjovschi. Selected by the Museum of Modern Art to present the image of the institution in this edition of The New York Times, Perjovschi started his work with a modern comment referring to contemporary art and to the manner it is presented today by the great museums (including the Museum of Modern art), a list including “Cubism, Impressionism, Abstract Expressionism, Modernism, Cafeteria, Shop.” Last year, the Museum of Modern Art hosted the first individual exhibition by Dan Perjovschi in the United States, entitled “What Happened to US?” In front of the audience, for several days, Perjovschi sketched graphic comments on the relations between present social and political circumstances and art on one of the walls of the Donald B. & Catherine C. Marron Atrium.